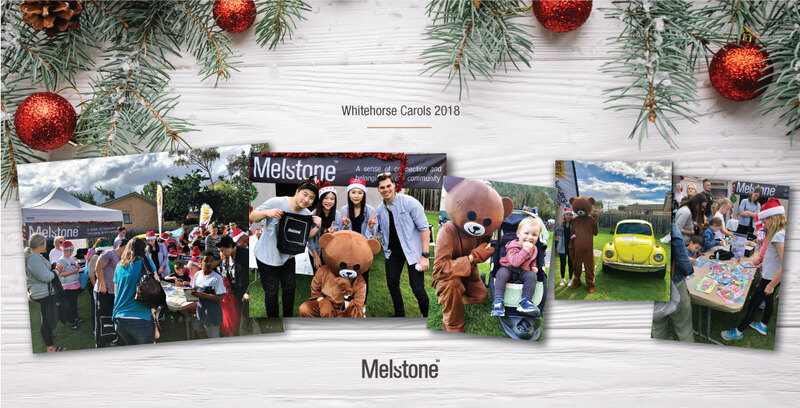 Community is very much at the heart of what we do at Melstone, so we were thrilled to participate in the Whitehorse Carols on December 16th. This popular yearly event drew huge crowds of all ages ready to enjoy the warm evening and get into the Christmas spirit. We hosted a marquee along with Melbourne charity Kids Under Cover who’s aim is to help to reduce youth homelessness by building small studio homes to keep families together and provide support for kids while they complete their education. At our marquee we offered free kids sand painting which was a big hit with the kids. The colourful sands were in high demand as kids were encouraged to express their creativity colouring in their illustrations. We also held a draw where one lucky person picked up a $100 Westfield Gift Voucher. Aside from all the fun at the Melstone marquee, there were performances at the carols including popular theatre performers Rob Mills and Verity Hunt- Ballard, children’s acts The Mik Maks along with performances from the local talents of the Blackburn High School Senior Jazz Orchestra, the Australian Girls’ Choir and the Combined Churches of North Blackburn. A big thanks to all who visited us and helped to raise much needed funds Kids Under Cover with a gold coin donation.